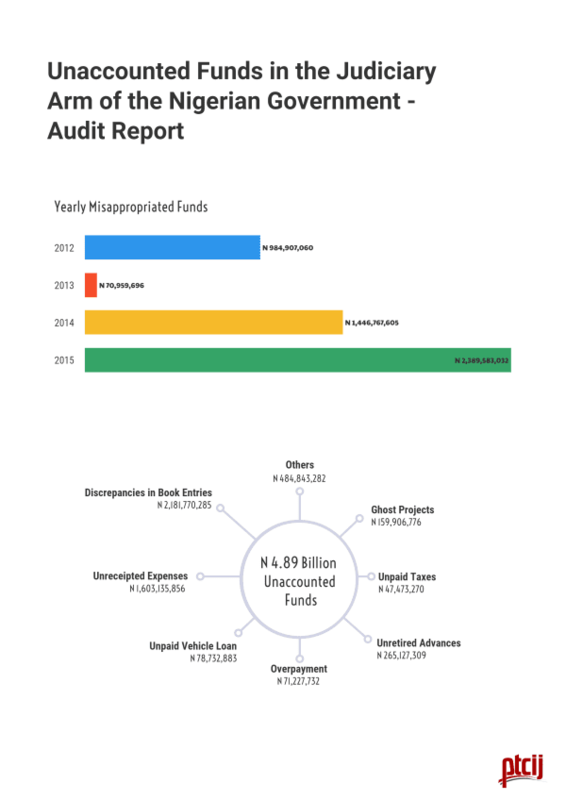 About N4.8 billion was either misappropriated or unaccounted for between 2012 and 2015, by federal courts across the country, audit reports of the Auditor General of the Federation revealed. A PREMIUM TIMES’ analysis of the reports covering four years shows how court officials illegally spent the taxpayers’ money in flagrant abuse of the Fiscal Responsibility Act. The 2015 audit report is the last so for from the office of the Auditor General. Most of the money was reportedly siphoned through ghost contracts, non-remittance of taxes, failure of senior court officials to retire advances collected for assignments and refusal to repay vehicle loans, the audit report revealed. In other instances, court officials overpaid for items bought, many payments made were without receipts and wide discrepancies were discovered in the transcript and analysis book, contrary to extant financial regulation. For instance, in 2012, the audit report showed that N985 million (N984,907,060) was not accounted for. In 2013, officials could not explain what they did with N71 million (N70,959,696) and in 2014, N1.4 billion (N1,446,767,605) was misappropriated through unlawful insurance policies, failure to pay taxes and missing documents to back expenditure. The amount misappropriated in 2015 almost doubled that of the preceding year. That year, the audit report revealed that officials of federal courts could not account for N2.4 billion (N2,389,583,032). A common scheme employed by officials to steal funds was the award of ghost projects, the report showed. Judicial officials serially released funds for projects that were either not executed or partially executed. 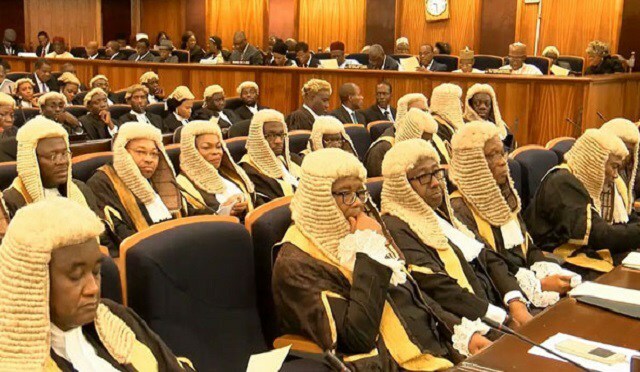 For instance, in 2012, the Court of Appeal in Abuja paid N20 million (N20,125,416) to five contractors to supply food supplements to judges and head of units. However, an audit of the payment vouchers and distribution list made in respect of the supplements discovered that out of 2,199 units of food supplement allegedly received, only 479 were distributed. Officials could not account for the balance of 1,720 units of food supplements valued at N15 million (N15,038,950). The missing supplements were not included in the distribution list. They were also not physically available in the store as at the time of the audit. In all, the Court of Appeal Abuja division could not account for N 160 million (N159,906,776), the reports showed. Taxes are the fuel with which economies are run. Taxes helps in the provision of basic amenities and infrastructures which in return translates to a high living standard of citizens. But officials of the Nigerian judiciary saddled with the task of collecting withholding taxes from contractor and companies, in some instances charged contractors only half of what they are required to pay by law or did not impose the required tax at all in other instance.